in Italy. The artist ranks amongst one of Finlandʼs leading contemporary photographers. 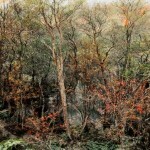 various seasonal colours of nature, which Tuori painstakingly documented all year round. its ability to represent an object. the Finnish National Council of Photographic art. Santeri Tuori was born in Espoo in 1970 and currently lives and works in Helsinki. Denmark; EMMA, Espoo Art Museum, Finland.